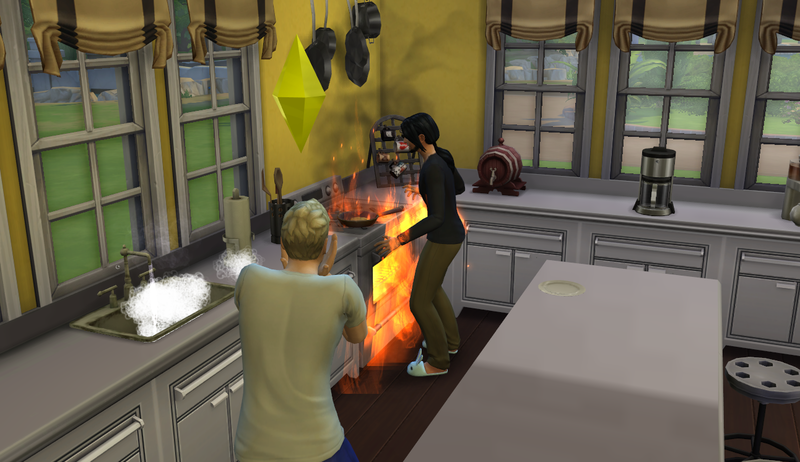 Adriel’s first day in the legacy house was quite eventful. 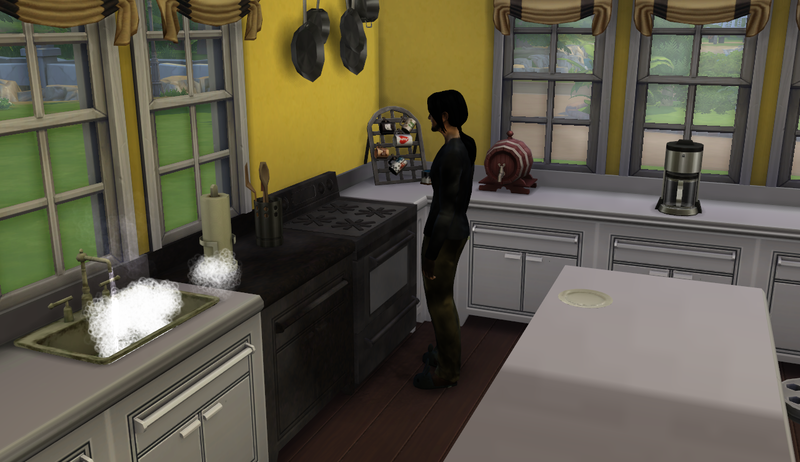 As I had Elisabeth chatting up her future spouse, I got a popup that there was a fire! I had everyone try and extinguish it but only Adriel was successful. The rest of them panicked and then ran outside to get away from the fire. The family was a little short of funds at the time (bills, you know) so the stove and counter replacements would have to wait. That PLUS the sink glitched out on me. 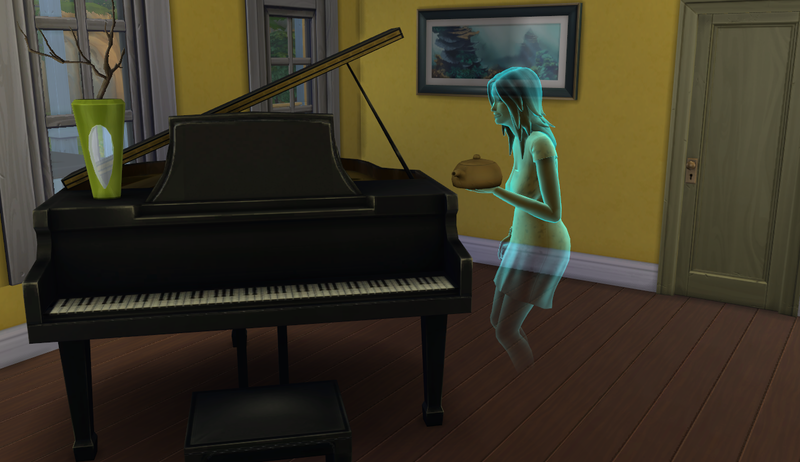 Thankfully, it went away when I moved someone out which was great because it kept making the running noise. Very annoying. I decided to go the non-traditional route job-wise for Adriel and he went to work as a freelance programmer. I know it was pretty lucrative for Ryu so I thought it would be a good idea. 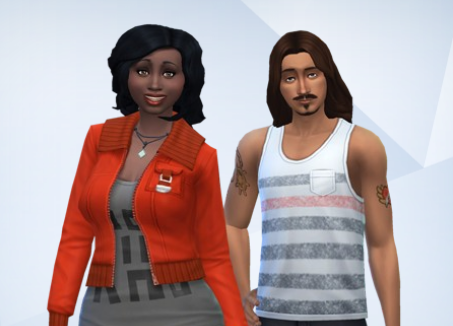 During Michiru’s pregnancy I worked on revamping the garden and setting up her siblings with their spouses. Maggie also aged into an elder. She’s still looking fabulous. And that garden!! 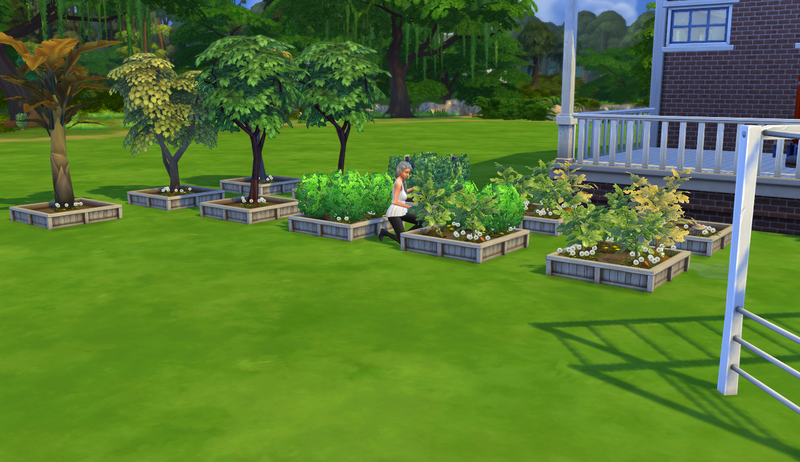 I decided to go with garden boxes and I was able to cut back on the extra plants. Almost all of the plants are spliced now. I still don’t have a complete garden but I don’t know if that’s something I want to work towards right now. Toya, Yuki, and Elisabeth all found partners and left the house to start their own families. 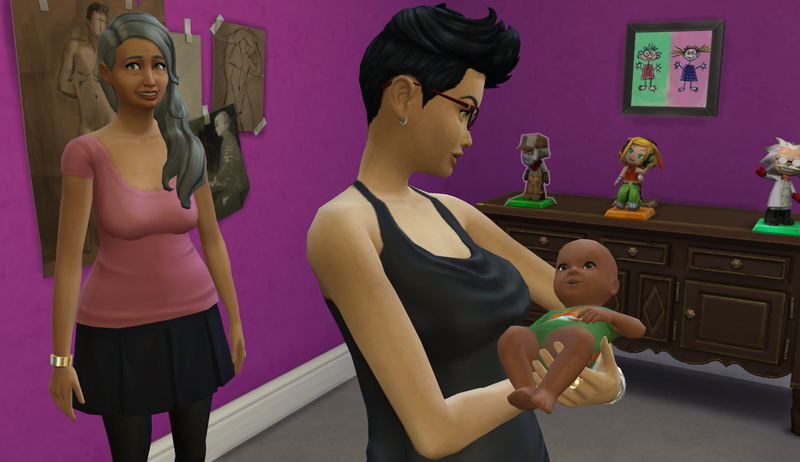 I think that one of them will have a kid soon and I’ll find out as soon as Maggie completes her aspiration. 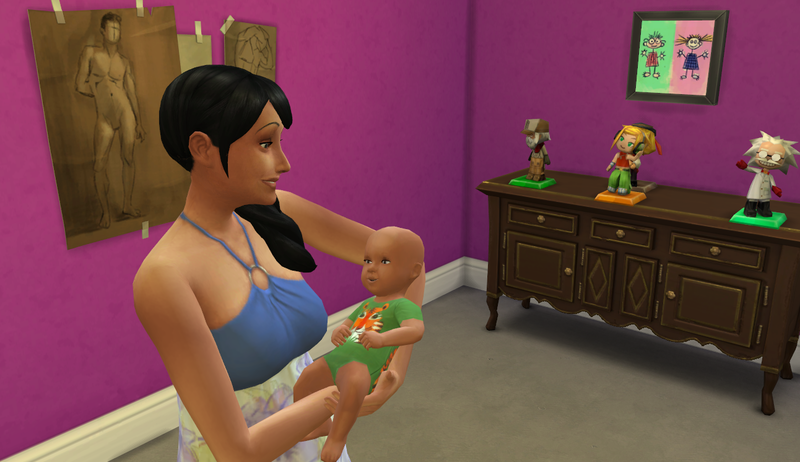 Eventually, Michiru went into labor and woke up Adriel to take her to the hospital. Seeing how far out her stomach went I sort of thought, oh, maybe she’ll have twins or maybe even triplets? Nope! Just one baby – a boy that she named Tachi. Elisabeth was still living at home at the time so she was the first to greet her nephew. Since we’re at another milestone, here’s our current family tree! Maggie came upstairs to keep her daughter company and say hello to Mr. Tachi as well. While Tachi slept the ladies got to work. 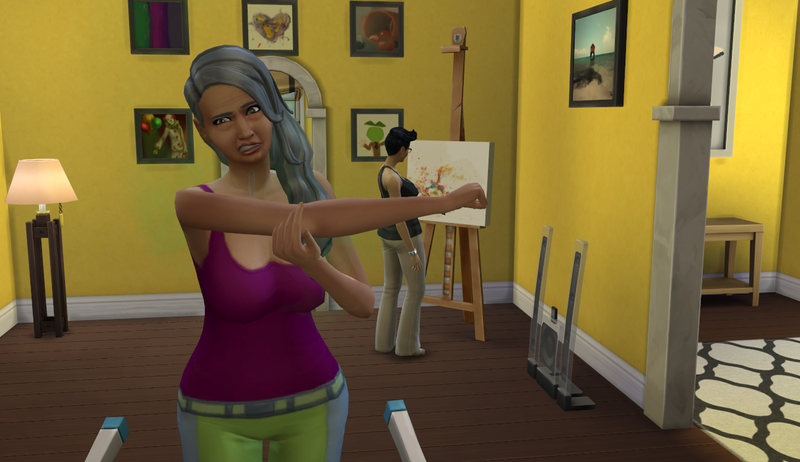 Michiru painted my favorite playful painting (I already had 1 or 2 of that one in the house) and Maggie worked out nearby. 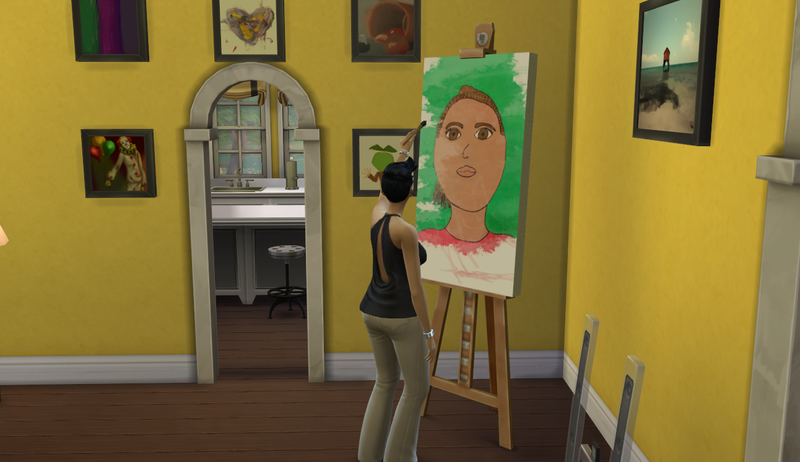 Next, she worked on her “realism” painting. I don’t know if that’s very realistic. Bonus: Rei crafted a teapot out of clay. Thanks, Rei!